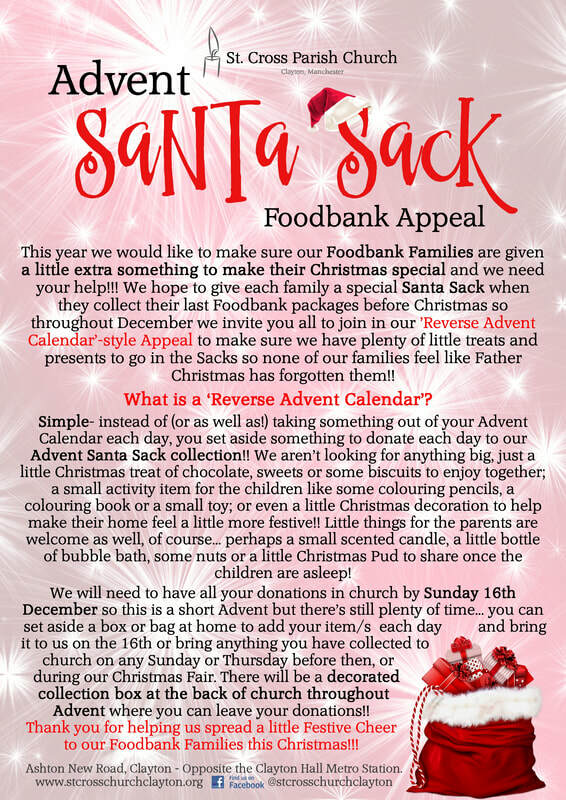 We will need to have all your donations in church by Sunday 16th December so they can be sorted into the Santa Sacks to be given out to our families on Friday 21st so this is a short Advent but there's still plenty of time... you can set aside a box or bag in your home to add your item/s to each day and bring it to us on Sunday the 16th, bring anything you have collected to church on any Sunday or Thursday* between now and then or bring donations to our Christmas Fair on Saturday 1st, 12-3pm. There will be a decorated collection box at the back of church throughout Advent where you can leave your donations!! *After services Sundays 12-1pm and Thursdays 11-11:30am- or during our Foodbank hours on Fridays 3-4:30pm (please speak to one of our Foodbank volunteers on Fridays as the donation box may not be accessible). Take a look at our event page over on Facebook where we'll be posting ideas throughout the appeal! !